Electronic Cigarettes have been added to the Kansas University smoke free policy, effecting six campuses, and 28,000+ students. 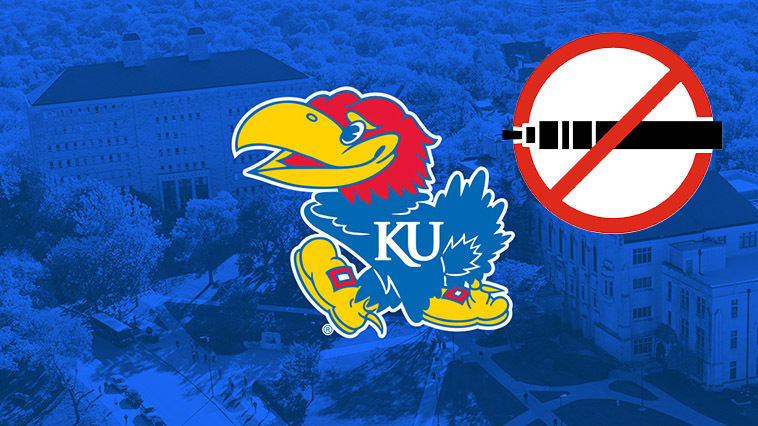 Tobacco Free KU has joined a list of universities nation-wide, promoting similar smoke-free policies on college campuses. This should come as no surprise with nearly every state in the US now enforcing smoke-free environments. The Tobacco Control Act passed by the FDA August 8th, 2016 officially classified vapor products as tobacco products; avoiding legal differentiation altogether. The grouping of electronic vaporizers with traditional cigarettes meant that any tobacco-free campuses were technically vape-free as well. Confusion followed in the wake of the passing of the Tobacco Control Act, however, as tobacco products were defined directly at the federal level, and smoke-free products like vaporizers were not. So, in response to the delay, nationwide enforcement began at the state level, giving birth to the ‘smoke-free’ policy. Smoking and vaping is now covered on 2,212 campus sites, including KU. Tobacco cessation programs and support to faculty, staff, and students. FDA-approved nicotine replacement therapy products for the purpose of cessation. Assistance for those students looking to overcome tobacco or nicotine addiction through the KanUQuit program. Assistance to anyone looking to quit tobacco use available through the KanQuit program. At first glance, nothing seems that peculiar about the exceptions listed above. But after doing some quick research, some concerns come to light. 20+ years ago, success rates for traditional means of smoking cessation were less than optimal, with 10–12% of smokers putting down the icky-sticks for good. More recently (2015), the CDC reported 55.4% of adult daily smokers and 66.7% ages 18-24, have been able to stop smoking for one day or more. Long-term data has not been collected on cessation success. FDA approved NRT (Nicotine Replacement Therapy) is just another term used for smoking cessation. The modern day vaporizer was brought to European markets in 2006, and to the U.S. in 2007. Since then, users around the world have reported having success giving up smoking through the use of smoke-free products alone, after failed attempts with NRT (smoking cessation methods). Staying active as a vaper, to help fight for your rights and access to healthier alternatives, has never been more important. For the most up-to-date news and all maters vape related, including calls to action in your area, visit CASAA.org. For other groups you can join to protect your vaping rights, check out this article.